Live Action Games for everyone to participate in! This year's dates are September 4 ~ October 17, 2010, weekends, Labor Day & Columbus Day 10 AM to 7 PM, Rain or Shine in beautiful Bonner Springs, Kansas, just 15 minutes from downtown Kansas City. The Festival puts their 180,000 guests and participants center stage this season with, Once Upon a Time there was You. Throughout the village the events from the evening before at Cinderella's Ball are the scuttlebutt of Canterbury. Every character has their own story to tell about how "last night's events" played out and they are asking everyone's help to figure out what will happen today. Will the Prince find his lady after trying the glass slipper on every woman in the village? "Everybody has a story", says Entertainment Director Jim Stamberger. "Our guests are as much a character in our show as any actor on the streets of Canterbury". New to the Festival, the Duxbury Wench Wine Bar, featuring the artistry of the Trinchero Family Estates. Several wines will be perfectly paired and available for sampling throughout the Festival day with special demonstrations twice daily. 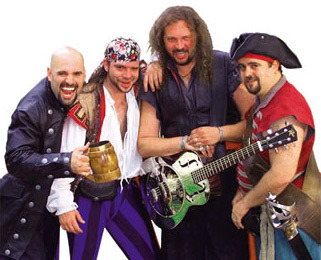 Jolly Rogers sing "All for me Grog"
Click here, mate, to give us a listen on Chivalry.com. Ninety thousand pounds of world famous turkey legs are on their way to Canterbury as well as a host of other treats found only at the Renaissance Festival. On the menu this year in addition to delicious soups, the Festival will add seafood and chicken salad in a bread bowl, shrimp and chicken Caesar salad, batter fried steak bites served with dipping sauces, fried pickles, batter fried asparagus and green beans, breaded portabella mushroom wedges, Bangers and Mash, giant cupcakes and more desserts at the Cup and Chaucer Coffee House. In fact, every lane of the shire is lined with temptations. It's useless to fight when you're at the Festival. It's a day to indulge all the senses! The Kansas City Renaissance Festival reinvents the hilarious six course Feast of Fooles each day at 1:00 pm with the all new Pirate Adventure Feast. Guests take sail for the new land but have to roll over a sea of scoundrels to figure out why they are stuck in the hull with a crew who couldn't navigate their way across a pond! Guest performers each day include Festival veterans the Jolly Rogers and Musical Blades. Tickets are $54.95 and include one day's admission to the Festival and a special edition goblet commemorating the adventure. Adult beverages start at $3.00 each. 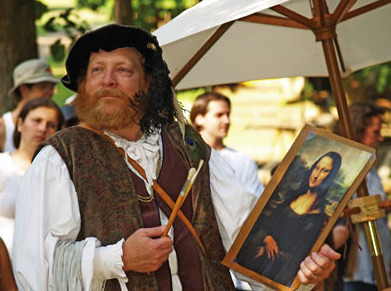 Reservations are strongly encouraged at www.kcrenfest.com or by calling 913-721-2110.
discusses the Mona Lisa with the crowds. The Kansas City Renaissance Festival is like walking through the gates of time to another age where guests from around the metro, the Midwest, the country and sometimes the world get a taste of 16th century life. Almost 200,000 fans come to be a part of history whether learning how a blacksmith creates tools from iron, chatting about art and philosophy with Leonardo Da Vinci, practicing with the Queen's lacers and seamstresses, shooting arrows with the infamous Black Archers, training with the Royal Guard or fighting barbarians in the Wildewood. Crowds are awed by performers on twenty stages of non- stop entertainment, including jousting by the knights of Joust Revolution four times a day. Entertainment runs continually through the shire with a wide variety of music, comedy, magic and choreographed combat. of the Kansas City Renaissance Festival. At every turn artisans can be seen demonstrating their talents in a wide variety of media. Ceramic ware, jewelry, clothing, accessories, games and toys, blown glass and intricate leather work can all be found with a 16th century spin. The process to exhibit at the Renaissance Festival includes a jury procedure that begins for each artisan months in advance. Only 165 exhibitors are honored each year. Giant copper dragons, fantastic fountains, hair braiding, exquisite jewelry and wearables are just part of the offerings in Canterbury. This Renaissance "mall" offers a unique shopping experience for those in search of memorable gifts and treasures. A delicious part of every afternoon includes the hostess Lady Mayor creating what she thinks is a sophisticated high tea only to find that her entertainment has gone awry and all she is left with is a gypsy riot! Pandemonium begins each day at 2:00 pm for $9.95. The Royal High Tea will again be held in the Wildewood and this year offers homemade trifle, cucumber sandwiches, chocolate covered strawberries, cookies and cakes with flavored teas, iced and hot. The Royal Smoker remains in the Wildwood at 4:30 each afternoon hosted by the Lord Mayor's Company featuring comedy and song for an adult audience. The Royal Smoker offers cigars, ale and refreshments as well as an hour of "grown-up" comedy and song. Ticket prices are $9.95. Seating is limited. Tickets can be purchased inside the front gate, online or at event entrances based on availability. Tickets can be purchased at the Festival gates just north of I -70 and K-7 Highways in Bonner Springs, Kansas on show days at $18.95 for adults, $9.95 for kids. 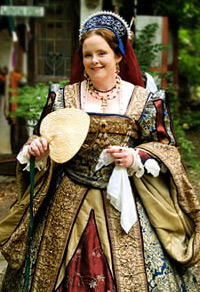 There are weekend specials listed at www.kcrenfest.com or guests can call 913-721-2110 for group ticket prices and information on parties and weddings at the Festival. Discount tickets can be purchased at Kansas City Hy Vee's and Walgreen's, regional Dillon's, Baker's and Gerbe's and online at www.kcrenfest.com. After the Festival, you can enjoy the creepiest nights coming this fall, The Phantom Feast which is in its fifth incarnation. This classic tale of "Dracula, A Madman's Tale" will take a contemporary spin in the steam punk genre. The battle between good and evil will begin when Van Helsing and the beautiful Romani girls square off against the Count and his beguiling brides of darkness. Auditions for this show will be September 15. This ghoulish dinner hosted by Dracula and his minions runs eight nights on the Festival grounds, October 21-24 and 28-31. Tickets are $45 and include a hearty six course meal and two hours of hauntingly clever entertainment provided by eager hosts who are dying to have you for dinner. Adult beverages start at $3.00. If you want to add this article to your list of favorites or email it to a friend, please use this permanent URL, https://stores.renstore.com/-strse-template/1009A/Page.bok. Permission is granted by the author to quote from this page or use it in handouts as long as you include a link back to Renstore.com.